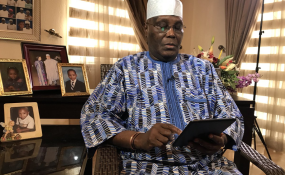 A former vice president of Nigeria, Atiku Abubakar, on Thursday said that providing good leadership and fighting corruption would not make Nigeria's problems disappear. Mr. Abubakar spoke at the launch of Tola Adeniyi's book, Belly of Vultures, in Lagos. According to the former vice-president, restructuring would also not solve all of the country's challenges. "I say this because some of those who argue against restructuring keep saying that it is not our main problem. Some say it is good leadership that we lack. Others say it is corruption that we should focus on instead," Mr. Abubakar said. "Well, my position is that all are important and should be addressed. But to pretend that the critical issues thrown up by the current deformed structure of our federation will disappear as soon as we have good leadership or tackle corruption is to miss the point. In fact, it is disingenuous. "Our current structure facilitates corruption and makes it more difficult for the kind of leadership being clamoured for to emerge. This is a structure that emerged at a time of military rule and sustained by the oil economy. Some of the enduring features of that oil economy have been excessive centralisation, corruption, oil dependency and low productivity. When we restructure, we will be forced to pay greater attention to production rather than rent-seeking. "We will improve security (with a decentralised police force) and, therefore, improve the environment for investment and job creation. And the federating units will have greater autonomy to decide on their priorities and peculiar challenges. So restructuring is critical for us although it is not a magic wand that would solve all our problems." Mr. Abubakar said the call for restructuring is not a sectional demand and added that it would benefit the entire country. "Those who fear that it is designed to hurt them to the benefit of others or to benefit only them at the expense of others are grossly mistaken. A country, including its economy, is like an organism. Thus what affects one part affects the other parts and the country as a whole. "The existing structure impedes our progress as a nation irrespective of what specific sections think. Similarly, restructuring, if properly done, will benefit the whole nation, whatever the short-term inconveniences a section or sections may feel." Mr. Abubakar further said restructuring would not only strengthen national unity but is also critical for the country's economic development, well-being, and peace. "Our current structure, which is based on oil rents, is vulnerable because oil has probably reached its peak as the chief energy source for the world economy," he said. "The drive towards renewable energy and away from oil seems irreversible now. This is important for all of us and especially for those in the oil-producing region, where some people sometimes talk about restructuring as though it is designed to punish the north. The good news for the north is that a restructured Nigeria is in the North's long-term economic interest. "We should not be fighting for a bigger share of what is a disappearing resource. It amounts to a fight for a bigger share of the past, and not the future. So both the oil-bearing sections and non-oil bearing sections of this country need to pay more attention to agriculture, fisheries, renewable energy, biotechnology, information technology, Nano-technology, artificial intelligence and so on."